Hello, I'm Monica and today I thought was a good day to start my own blog! Today for the post I'm actually starting with Challenge #16: It is to make a Christmas card not using any of the traditional colors. So that meant no reds, greens, whites, blues, silvers or golds. The "creator" of the challenge even said I couldn't use creams!!! (Sigh) We really weren't left with any Christmas colors. 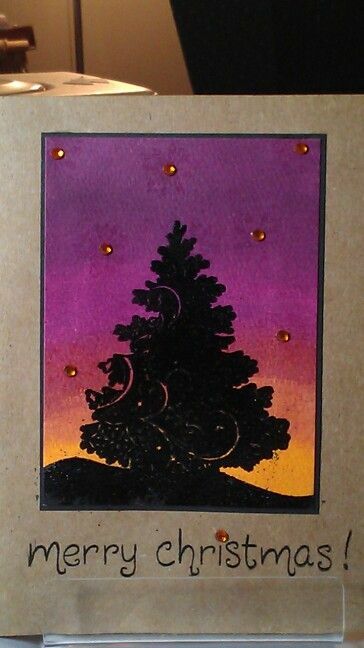 I decided to use a kraft card base, emboss a silhouette Christmas tree on a distressed (purple and orange) sky back ground. Thanks stopping by. Feel free to play along. I love to see the different takes on the challenges!